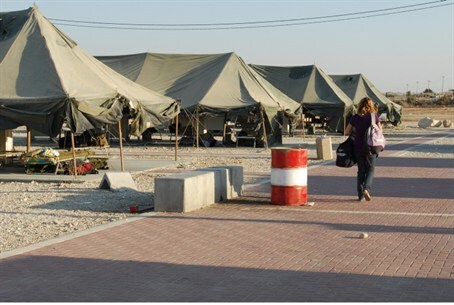 The first stage in the evacuation of the IDF's Tzrifin base is now complete, freeing up over 10,000 square meters for construction of the “city of the future,” planned for the site when the army withdraws from it altogether by the end of the decade. The Tzrifin base is generally used for administrative and educational activities, with many new soldiers serving training stints there. The base is being moved down south, to a new super-project being built in the Beersheva area – thus freeing up a large chunk of prime real estate in central Israel. The decision to move the base was made two years ago, and is part of an overall IDF project to move bases from expensive real estate in the Tel Aviv area to less expensive areas. The newly freed-up lands will be auctioned off to contractors, with the IDF netting the proceeds, and the pool of newly-available homes, the government hopes, helping to reduce the cost of new homes. The IDF is set to earn billions of shekels from the land sales. When the rest of the base's 75,000 meter total area is evacuated, the contractors will be invited in – and they already have plans for the construction of thousands of housing units, office buildings, shopping centers, and more. Before that, the old buildings at the site are to be demolished, and the IDF has issued a tender for demolition companies to begin dismantling the structures that have been evacuated. Among the conditions of the contract – the recycling of as much material as possible, in order to preserve the environment and have as little impact on it as possible.